I’m very pleased to report that my latest Kickstarter Project was fully funded! Thank you to everybody who backed it! Before last term, however, I had always left the fun of designing these games to the students. I have seen some wonderful ones, a lot based on Snakes and Ladders, some on Monopoly, memorable versions of Twister and Cluedo, and other that freestyle it. But then I was wondering what my version would look like. I also was trying to explain to my students how the sessions we do in class map onto the researching and writing they should do, which I always struggled with. 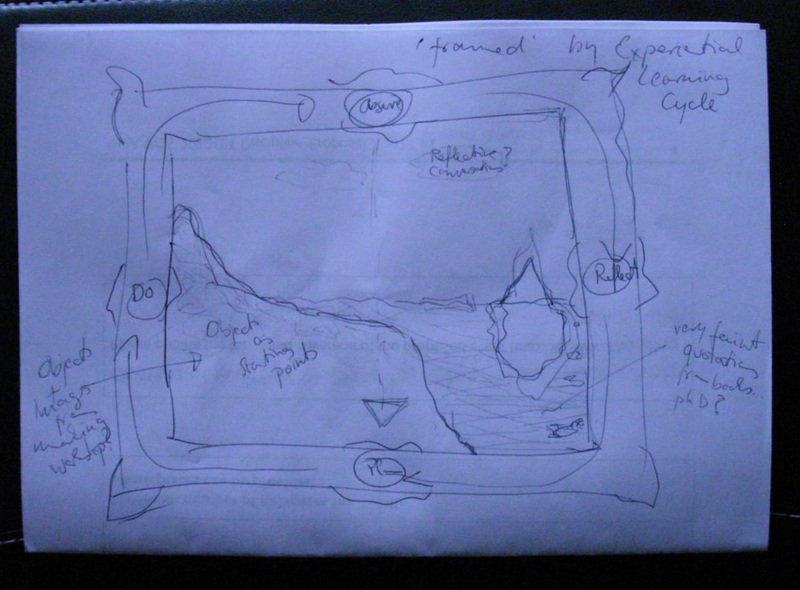 So one day I started doodling a game, fitting it into the analogy of the iceberg (which you might be familiar with from Writing Essays by Pictures), that some things are visible over the waterline – i.e. the writing of drafts and the finished piece – and some are invisible under the waterline – i.e. the research. But what in my experience students often didn’t understand (or at least failed to put into practice) is that you don’t do all the research first and then just write it up; in order to put together a great essay, you do some research, some writing, some more research, some rewriting, etc. And the iceberg shape works for that – if you are on a path starting in the middle, going down, then coming up, then going down (this time deeper), and coming back up again. Putting this together as my own sketched version of the game, I could explain this journey much more clearly than with just a timetable – and I liked it so much I made a basic handout for my second years as well, to remind them of the stages that should go into writing an essay. After sharing this with some colleagues as well (for example at the session I wrote about here) I thought why not turn this into a version that is shareable, hence the Kickstarter project. Once they are finished, I will share how they turned out in a new post. 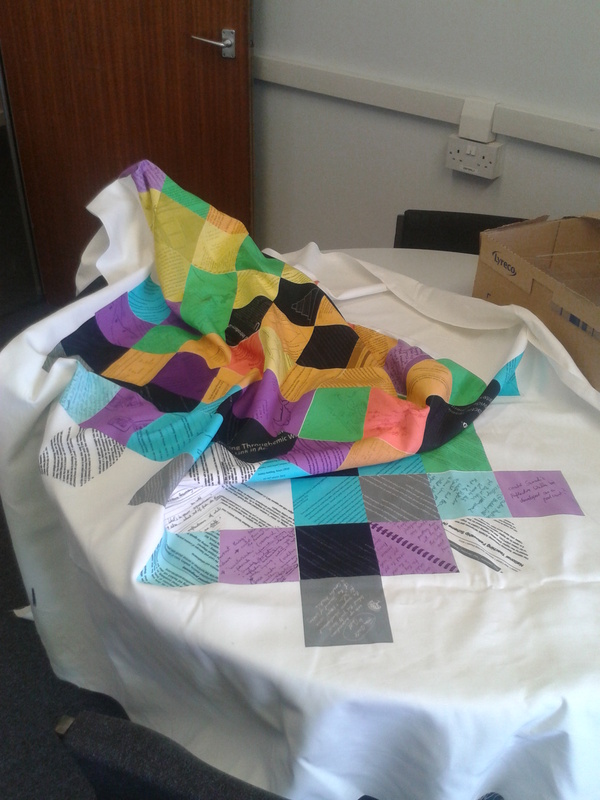 As you know I have been thinking about visual ways of representing experiences in patchwork/quilt form for some time. 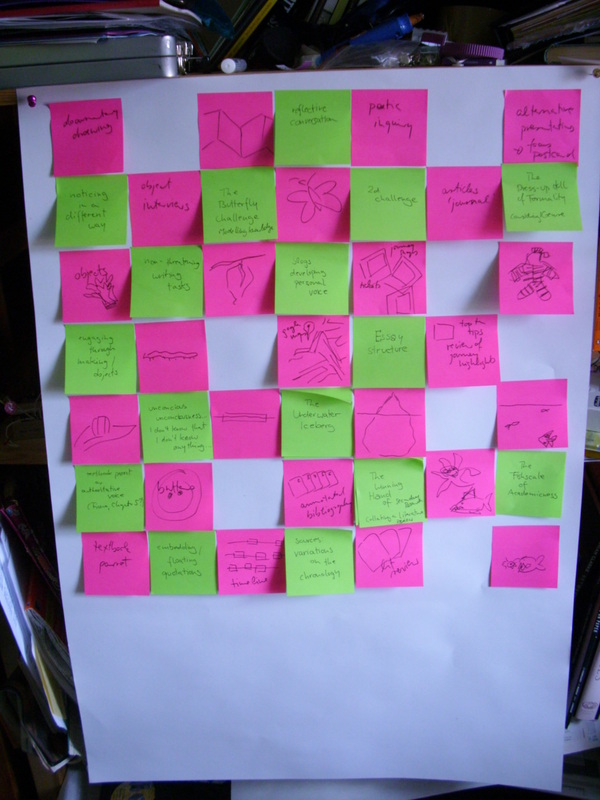 And this had developed quite nicely to what I call the ‘Post-it stage’ (other sticky notes are available) until the idea of the fabric printer moved it into another dimension of possibility. but it still felt a bit vague, and I was thinking that I would like to test this out in a smaller, contained way. So having to do a poster anyway, I thought, why not come up with a patchwork design to put on the poster – and then if there is time I could run that through the fabric printer and see how it comes out. My first idea was inspired by an artistic quilt – so something much more about one large image rather than regularly shaped bits that are joined together. I also liked the idea of using a frame in some way. Sarah has done a poster with a large ornate gold frame in it, which I really like, and I was thinking of nicking that idea and using it to show Kolb’s Experiential Learning Cycle, which in a way is framing almost everything that I do – it sort of provides a really good model of how I approach both teaching and learning. So I was thinking of having a gold frame and on each of the four sides have a little label with one of the four stages Kolb refers to. As the actual image I thought I would use the idea of the Land- and Seascape of Creative Practice, but extend it so that it includes the Underwater Iceberg and the Fishscale of Academicness. A bit complicated, but in my head that still makes sense. And while I still like the idea, I was wondering whether it might be a bit inappropriate because it is very much linked to art and design and takes studio-practice as a starting point. Really what I wanted to do was to come up with a poster/quilt that would prompt me to talk about the actual activities I do with my students (some of them still in development), rather than a lot of theoretical background that might not apply anyway. So maybe square pieces added together to make a larger square image after all? Sitting down again with another large sheet of paper and another stack of post-its I was thinking of how much overlap there would be between the quilt I am planning about the development of my work and teaching philosophy and this one. In a way I wanted this one to be more ‘hands-on’, really focus on analogies and activities I actually use in my teaching, rather than give evidence of inspirations and conference presentations. But I also wanted to include some quotations that might be important. I took key illustrations from the little tactile academia book(let)s and things I draw on my whiteboard in class as starting points and after some playing around I realised that it might be nice to have a checkerboard effect – with images as one colour and words as the other. After a lot of to-ing and fro-ing I came up with a size and order I liked. Now it was just a matter of filling it up. I say ‘just’, but of course this took actually quite some time. It is interesting, but it is at this stage, that I might abandon a project. In a way by now it is worked out – and I have a very clear idea in my head of what it would look like if it was actually finished. Of course in that case it would never really be shareable, so it is a good thing to have somebody waiting for a file they can print as a poster and a deadline to boot. A period of designing began. I started with the images I already had – from the booklets and teaching prep, etc. – but invariably they were all somehow wrong in size or format, so I ended up redrawing most of them. I had some photographs I wanted to include, too. Putting them together just didn’t look as nice as the pink and green post-its, so I decided to treat them so they would all be black and white (well mostly), and so that they were more likely white on black than the other way around, because I wanted to emphasise the checkerboard effect. Now all I had to do was populate the in-between spaces. I knew I wanted this to be text based, some squares giving my names for the activities (or books), some of them quotations that underline the importance and relevance of experiential learning (and in extension teaching) and some more informal ideas and activities I use in my teaching. For these three I used different typefaces, but tried to keep the font size equivalent. I also decided on a background colour, going for the colour of this website to make it tie in (and because I didn’t want it just white and couldn’t think of anything better). And my mini quilt was done! Yippee! With it being the Easter break I don’t have access to the fabric printer just yet, but will keep you posted on how this turns out!